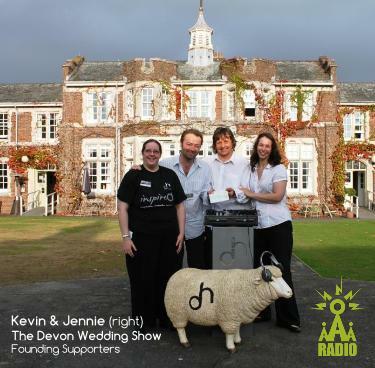 Jennie and Kevin of Serenity and the Devon Wedding Show - without you none of this would have happened! Wavestreaming - WOW! Your Cloud DJ product is AMAZING! Billy Lindon for the compressor - hank you Billy, controlling our levels has made a massive difference! Big Red Rehearsal Studios for lending us kit - you guys rock! Matt Boyd - for his help in the early days, for on-going tech support and tuning in/skypeing in from Scotland. Neil Long - for our fabulous AAA jingle, courtesy of www.whyvoiceoverswork.com - 'bespoke VoiceOver for your business website'.